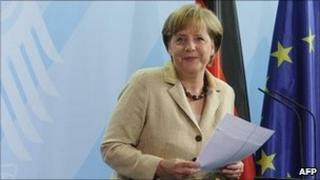 German Chancellor Angela Merkel has played down the chances of Thursday's emergency eurozone summit resolving Greece's debt crisis. She told a news conference that there would not be anything as "spectacular" as a restructuring of Greek debt. The meeting will attempt to agree a second bail-out of Greece in a hope of calming financial markets and stop contagion spreading. She said: "Thursday will help in this, but further steps will be needed." At the weekend Mrs Merkel indicated that she may not attend the meeting unless there was a likelihood of a concrete deal on a second Greek rescue. Germany has been at odds with the European Central Bank (ECB) over its insistence that private investors in Greek bonds share the pain of another rescue deal. The ECB believes that forcing private investors to take losses on their loans is effectively a default by Greece on its debts. But Germany, Finland and the Netherlands are in the forefront of calls for private investors to share the burden rather than just leave it to the taxpayer. It has emerged that one possible compromise being considered is the raising of money through a special tax on eurozone banks. France's European Affairs Minister Jean Leonetti said the bank tax proposal "would have the advantage of not involving the private banks directly and so avoid the problem of a potential default". French banks are heavily exposed to the Greece economy. But the French Banking Federation said on Tuesday that the idea was a "strange logic". Jean-Claude Trichet, ECB president, repeated his strong belief that a "credit event", or default, must be avoided. Otherwise the ECB would cease financing the Greek bank sector. However, ECB council member Ewald Nowotny appeared to break ranks with a suggestion on Tuesday that the bank may compromise and allow a temporary credit event. "There are some proposals that deal with a very short-lived selective default situation that will not have major negative consequences," he told CNBC television. Eurozone officials have also considered a complex plan to lend Greece money to allow Athens to buy back its own debt at a reduced price on secondary bond markets. This would help Greece to delay debt repayments.